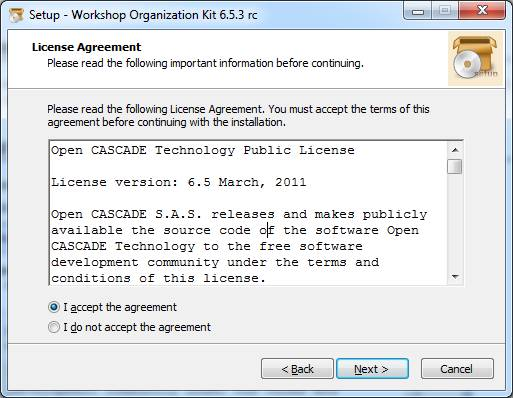 WOK is a legacy build environment for Open CASCADE Technology. It is required for generation of header files for classes defined with CDL ("Cascade Definition Language"). Also tools for generation of project files for other build systems, and OCCT documentation, are integrated to WOK. Before installing and using WOK, make sure that you have installed a compiler (it is assumed that it is Visual Studio on Windows or gcc on Linux and MacOS) and third-party components required for building OCCT. You can change these settings at any time later. For this click on the item Customize environment (GUI tool) in the WOK group in the Windows Start menu. In command prompt window using option WOK TCL shell. In Emacs editor using option WOK Emacs. Using Emacs is convenient if you need to work within WOK environment. By default WOK installer creates a WOK factory with name LOC within workshop dev. I.e. the WOK path is :LOC:dev. Unpack the .tgz archive containing WOK distributive into the installation directory <WOK_INSTALL_DIR>. Double click on file wokSetup.dmg in the Finder. This opens a new window. Drag and drop wokSetup folder from this window at the location in the Finder where you want to install WOK, i.e. <WOK_INSTALL_DIR>. Your installation procedure is over. To run WOK in Emacs navigate in the Finder to the folder <WOK_INSTALL_DIR>/site and double click on WokEmacs. To start working with OCCT, clone the OCCT Git repository from the server (see http://dev.opencascade.org/index.php?q=home/resources for details) or unpack the source archive. Then create a WOK workbench (command wcreate) setting its Home to the directory, where the repository is created ($CASROOT variable). The workbench should have the same name as that directory. Note that $CASROOT is equal to D:/occt now. Then you can work with this workbench using normal WOK functionality (wprocess, umake, etc. 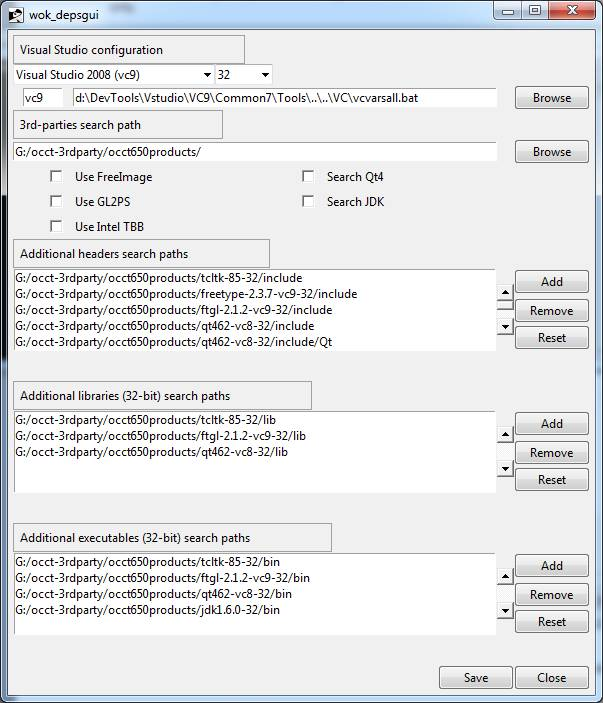 ; see WOK User's Guide for details) or use it only for generation of derived sources and project files, and build OCCT with Visual Studio on Windows or make command on Linux, as described below. -no_wprocess option skips generation of derived headers and source files. Note that this command takes several minutes to complete at the first call. Re-execute this step to generate derived headers, source and building projects files if some CDL files in OCCT have been modified (either by you directly, or due to updates in the repository). Note that in some cases WOK may fail to update correctly; in such case remove sub-directories drv and .adm and repeat the command. -dot=<path> the path to GraphViz dot executable.